"I don't stand with them," the president says of the lenders who refused a deal. "I stand with Chrysler's employees, management and suppliers." 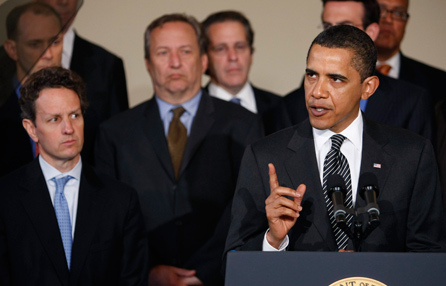 U.S. President Barack Obama speaks about the Chrysler Chapter 11 filing and its partnership with Fiat in front of his auto task force from the White House on April 30, 2009. The news that everyone was expecting from President Obama's speech on Chrysler -- that the automaker will file for Chapter 11 bankruptcy today -- was not the biggest news in his address. Nor was his announcement that a deal had been cut with Fiat "that would give one of America's most storied automakers a new lease on life." Far more important, and certain to dominate the cable news talk shows for at least the next 24 hours and probably a lot longer, was his direct attack on the hedge funds whose refusal to agree to the government's offer on Chrysler's debt sunk a deal that could have avoided bankruptcy. Obama said that all of Chrysler's major stakeholders had made sacrifices -- the United Auto Workers had agreed to major cuts, Chrysler's management had been "positive and constructive," and Chrysler's biggest lenders, led by J. P. Morgan, "had agreed to reduce their debt to less than one-third of their obligations." But while many stakeholders made sacrifices, some did not. In particular, a group of investment firms and hedge funds that hoped to hold out for a taxpayer-funded bailout. I don't stand with them. I stand with Chrysler's employees, management and suppliers. I don't with stand with those who held out when everybody else made sacrifices. The holdouts, Obama also said, were "a small group of speculators" who are "endangering Chrysler's future. The battle lines have been drawn. Moments before Obama spoke, the holdouts, now calling themselves "The Committee of Non-TARP Lenders of Chrysler," released their own statement claiming that they had made significant "concessions" and accusing the government of "overturning the rule of law and practices that have governed our world-leading bankruptcy code for decades." Fair enough. But now the hedge funds get to find out what a bankruptcy judge thinks of their complaints. Is the government overreaching, or are the hedge funds, as Naked Capitalism's Yves Smith put it memorably this morning, "completely out of hand in the utter shamelessness of their extortion ... eagerly, shamelessly, and openly harvesting their pound of flesh from financially stressed average taxpayers, and setting off a chain reaction in the auto industry which has the very real risk of creating even larger scale unemployment than the economy already faces?" Smith calls their attitude "reckless, utterly irresponsible, over-the-top greed." And judging by Obama's demeanor this morning, I think the president agrees. And I'm guessing that so will the American public. A popular president may just have guaranteed another round of applause.